Thread: Avid Ultimates + Black Ops =? Are the Avid Ultimate brake levers matched with the Avid Black Ops brake set, the best VBrake set up out there? Would XTR be next in line? And if so, are the Avids really worth roughly double the XTRs? Or is it a lot of hype? They sure do look nice though, don't they? And, anyone have the Ultimate Levers or Black Ops brakes they're looking to unload? 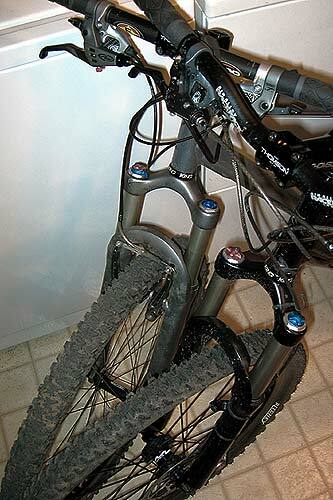 I just removed a pair of Avid Black Ops levers/brakes that I was going to put on eBay. Both were puchased in July 2003 if your interested. Cool. Just PMed you. Thx. on the left is a Superlight with Ultimate Vs and currently SD-7s. On the right is a Heckler with Ultimate levers and BBDBs. The Superlight initially had an Ultimate/Ultimate set-up, until I built the Heckler. The difference between using the SD-7 lever and the Ultimate lever with the Ultimate Vs is noticeable. The feel of the brake completely changed. I see another pair of Ultimate levers in my future, I know the feeling I want and the SD-7s don't seem to be capable. The Vs are on par with Shimano, but they never get loose and they don't squeel (unless your mechanic grabs your front wheel with greasy hands, but that's another story). The dry weather performance is close to disc brakes, but the feel is much lighter, none of that "high pressure metal sandwich" feel. They act like V brakes in the wet, they don't work so well and you will grind away at pads.